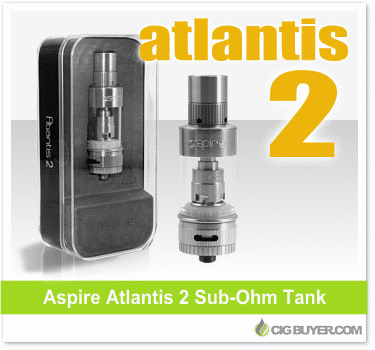 The new and improved Aspire Atlantis 2 has taken everything that made the original Atlantis so great… and made it even better. Constructed from stainless steel and pyrex glass, it’s compatible with the original 0.5 ohm silica heads; or the new organic cotton coils (0.3, 0.5, 1.0 ohm) for improved flavor and vapor production. It has a slightly larger 3ml tank, but the biggest improvement is the new adjustable airflow system; providing greater volume and more control. It even has adjustable cooling built right into the drip tip.